Once the donor feathers are prepared and ready, the patient is anaesthetized and the new feathers are imped onto the shafts of the broken feathers. 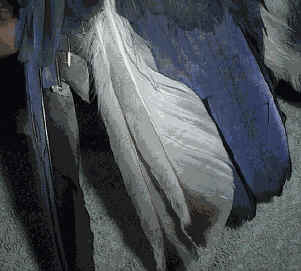 Care must be taken making sure the donor feathers are aligned with the bird's natural feathers. 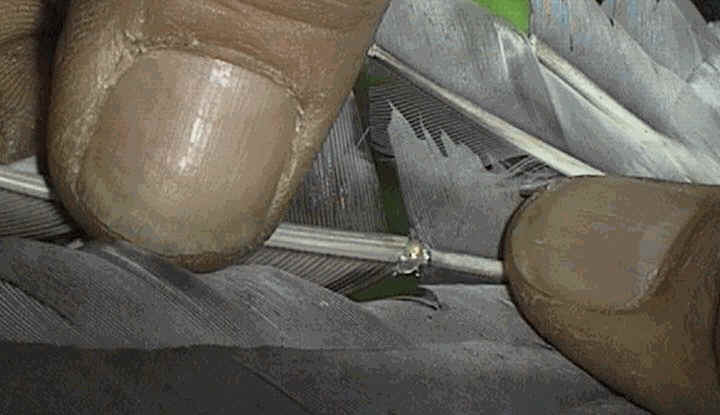 We continually check the alignment from both front and a backside, knowing that once the glue sets our feather is permanently in place until the next molting. As we add each new feather we check and re-check making sure everything is perfect. This imping procedure went extremely well. After having the 4 new primaries imped, the Kingfisher spent 3 days in our flight cage adjusting to his new wings and was then successfully released. If you're ever birding in the Long Beach area and sight a Kingfisher with 4 white feathers on its' left wing, you'll know it's one of AWRE's success stories.